From a team perspective, little changed on the leaderboard during the second round. 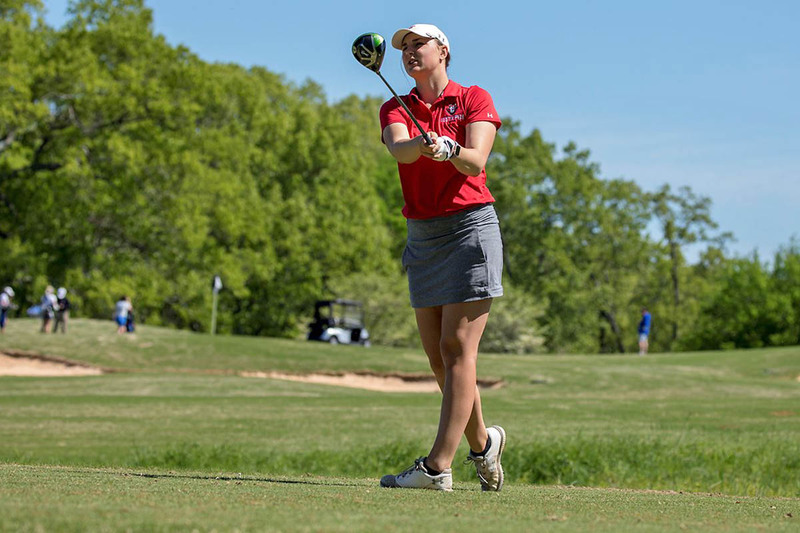 The top-five remained largely the same—the Govs improved by one shot with a 305 to sit at 611 overall, four strokes ahead of Tennessee Tech and nine behind Belmont. Murray State (580) is the leader, while Eastern Kentucky’s second-round 289 moved the Colonels (585) ahead of Jacksonville State (596). Few individual players in the field made a second-round move as big as Greene’s. The Clarksville native’s even-par 72 took her from 15th to sixth, the second-largest jump up the leaderboard in the entire round. She posted even-par 36 on the front and back nines, with a birdie on the 478-yard par-5 at No. 4 and the 147-yard par-3 at No. 10—the former one of just four birdies recorded at that hole on Tuesday. She’s the only Gov to sink multiple birdies in the first and second rounds and her 2.88 par-3 stroke average is tied for the third-best mark in the tournament. All-OVC honoree Taylor Dedmen maintained her spot in the top-20, matching her Round One effort with a 76 to sit in 16th with 18 holes to play. She again fired a 37 on the back-nine in Round Two, matching her opening-round effort by recording pars on eight of the nine holes. Junior Meghann Stamps and senior Taylor Goodley are tied for 24th heading into the final round and both look break into the top-20 with solid final rounds. Stamps (75-81—156) was burdened by a couple of big numbers on an otherwise-consistent day and still maintains the team-high with 25 pars. Goodley (79-77—156) continues to do her damage on par-5 holes, averaging 5.13 strokes through two rounds. Taylor’s sister Ashton Goodley (82-80—162) rounded out the Austin Peay lineup. Not only did she improve her opening round total, she birdied the penultimate hole, a difficult 365-yard par-4 which played as Tuesday’s fifth-toughest hole. Final-round action begins 8:50am, Wednesday from the Robert Trent Jones Golf Trail stop at The Shoals. The Govs will pair with Belmont and Tennessee Tech.